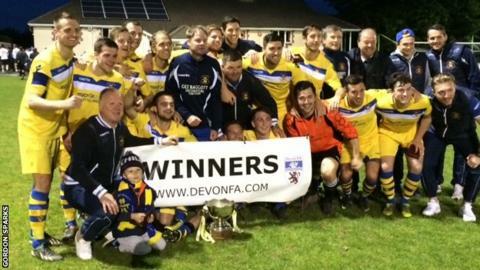 Plymouth Parkway claimed a unique treble after winning the St Luke's Cup to add to their South West Peninsula League and Throgmorton Cup wins. Having already beaten Exeter City in the semi-finals, Parkway defeated Tiverton Town 2-0 in the final at Newton Abbot as Levi Landricombe struck twice in the second half. It was club's first St Luke's win in its 26-year history. Tiverton boss John Clarkson resigned from his job after the defeat. "It was a great team performance so I cant take all the credit," Landricombe told BBC Radio Devon. "During the first half we were a bit quiet but, in the second half, we found a lot of space." Parkway had to win their final game of the season to clinch the league title before winning Sunday's Throgmorton Cup final. "It's an absolutely superb feeling," said Parkway manager Wayne Hillson. "To do a double is special but the treble is marvellous. "I'm buzzing for everybody at Plymouth Parkway but especially the players as they fully deserve this and it proves what a fantastic season we've had."